Waldron Trail is open, but the rest of this loop hike is currently closed. This loop hike rings the Waldron Ledge using a few different trails. It's a great shorter hike from the Visitor Center that covers a lot of picturesque ground. It travels close to Kīlauea Iki, down to the floor of Kīlauea Caldera, and then returns via a loop back to the Visitor Center. 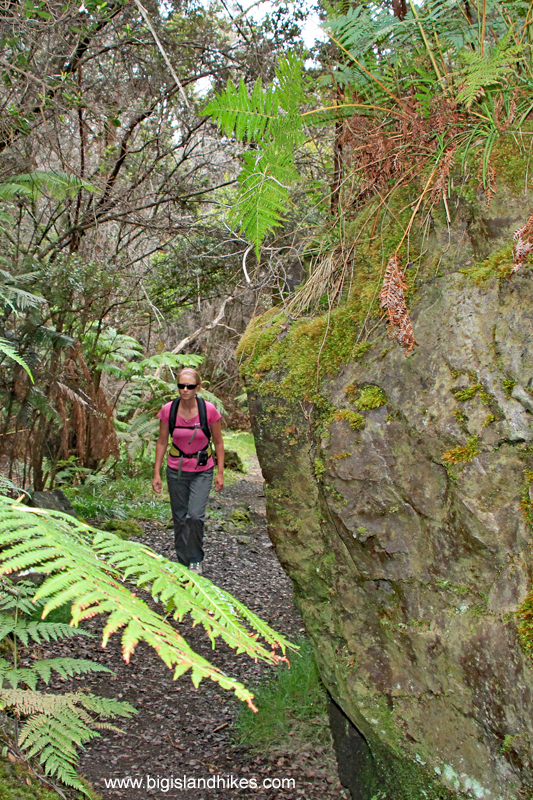 Big Island Hikes has several other hikes from the Visitor Center trailhead. See Sulphur Banks - 'Iliahi Trail Loop, The Crater Rim Trail, and The Halema'uma'u Trail. Trailhead: Find the entrance to Hawai'i Volcanoes National Park a few miles to the west of the town of Volcano Village. Pass through the entrance and drive straight ahead for less than a 1/4 mile and park in the Visitor Center parking lot. Hike: From the Visitor Center parking lot, walk across Crater Rim Drive on the designated pedestrian crossing and walk toward the Volcano House. Walk around to the back side of the Volcano House and find Crater Rim Trail. Hike southeast toward Kīlauea Iki crater. Parts of this trail are an old road closed in 1983 due to a 6.7 magnitude earthquake. (This is sometimes called the Earthquake Trail). In less than a mile, find the intersection with Kīlauea Iki Trail. Hike west, and quickly find another intersection. Leave the Kīlauea Iki Trail and hike west. Quickly find yet another intersection with the Byron Ledge Trail and hike northwest below the Waldron Ledge and descend gradually into Kīlauea Caldera. In 1/2 mile, find the intersection of the Halema'uma'u Trail. Take the Halema'uma'u Trail uphill for about 1/2 mile and find the intersection with the 'Iliahi Trail. Head east and quickly intersect the Crater Rim Trail again. Hike it back to the Volcano House and Visitor Center where you began the hike.